Thanksgiving is a time of gratitude. Today and every day we are thankful for the countless innovators around the world who are changing people’s lives by using technology to solve some of humanity’s toughest challenges. This month we joined leaders in business, community and government at the Montgomery Theatre in San Jose for the annual Tech for Global Good event celebrating five innovators who are using technology to benefit the environment and battle the threat of climate change. We also honored Paul Hawken as this year’s recipient of the 2018 James C. Morgan Global Humanitarian Award, presented by Applied Materials. Named after Applied’s chairman emeritus, the award was inspired by Jim Morgan’s belief that technology can be a tool to help us reach our fullest potential and turn ideas into solutions for a better world. Paul Hawken is a visionary and environmental leader whose work reverberates around the globe. He has dedicated his life to seeking justice and inspiring others to positive action, most recently through the publication of his recent book, Drawdown—The Most Comprehensive Plan Ever Proposed to Reverse Global Warming, and subsequent creation of Project Drawdown, an organization promoting 100 solutions to reverse climate change. 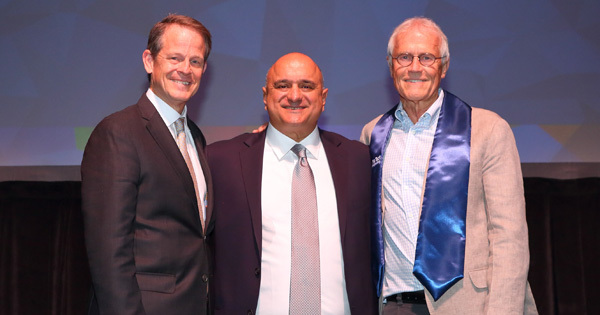 Pictured: Tim Ritchie (Tech Museum of Innovation), Ali Salehpour (Applied Materials) and Paul Hawken. As a long-time supporter of The Tech Museum of Innovation and believer in the power of technology to improve our world, Applied is pleased to salute Paul’s lifetime of service and positive impact with this year’s James C. Morgan Global Humanitarian Award. While the Tech for Global Good celebration is an annual event, the learning continues through a year-round Tech for Global Good Exhibit at the Tech Museum of Innovation in San Jose. Visitors can explore societal challenges, examine possible solutions and discover how this year’s laureates are using innovative technology to change the world. I encourage you to learn more about Paul Hawken’s work and this year's laureates in the video playlist below and to explore the role technology can play in advancing global good to address social issues. The next brilliant innovator could be you. Watermark Conference Takeaways: Listen. Support. Inspire. Advocate. In celebration of Women’s History Month, our employees share insights and inspiration from the Watermark for Women Conference in Silicon Valley. New Applied Materials Foundation initiative aims to inspire girls to pursue their dreams.